Yes, folks. 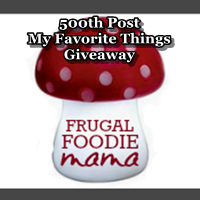 THIS is my 500th published post on Frugal Foodie Mama. First, I want to say a HUGE thank you to all of you who have been following along whether from the very beginning when I didn't even think to include photos with my recipe posts or even if you have just joined me on my journey today. Another one of my most favorite things is Pinterest. Not only has it become my #1 go-to site for finding new recipes that inspire me, nifty organizing tips, & new home decor ideas to try out, but it is also the #1 driver of traffic to my blog. Plus, I hit over 5,000 Pinterest followers last week! So, let's have a fun Pinterest contest, shall we? After you have completed the My Favorite Things Pinterest board entry, all other entries are optional bonus entries. Want to get a better look at all the prizes in the A Few of My Favorite Things Giveaway & get a good idea of what your My Favorite Things Pinterest board should look like? Then click on My Favorite Things board. *This giveaway is open to U.S. residents only. You must have a Pinterest account to enter. All entries for the winner will be checked and verified, so please make sure you are doing what you are claiming in the Rafflecopter or all your entries will be voided. No funny business, folks. ;). By entering you give the right to use your name and likeness. Number of entries received determines the odds of winning. One winner will be selected. Prize package & gift card will be sent via USPS by Carrie of Frugal Foodie Mama. Protected tweets do not count as an entry method for tweeting. Tweets must come from a public account. None of the above listed products, companies, or social media outlets are involved in nor do they sponsor this giveaway in any way, shape, or form. No purchase necessary. Void where prohibited by law. actually this is my first visit here. I saw a post on another blog and came to check out your site. So many of YOUR favorite things are MY favorite things, too! We have excellent taste! Congratulations.....that is awesome!!! Here's to the next 500! Okay, I am doing this backwards...I like your sweet & fun personality :) and Marvelous Mondays, and food! Congrats on your 500th post! I love your recipes. Congrats!! Thank you for the giveaway! Congrats on the 500! Great Giveaway! Congrats! I love so many of your favorite things! I just started following you recently, but you're super easy to talk to. What a great prize! I don't have time tonight to do the required entry (boo!) but you're about to make someone's week a whole lot brighter, Carrie!